Rigid-flex printed circuit boards are unique in terms of integrated construction of both rigid and flex circuit technologies. Unique construction comes with unique requirements that should be reviewed and implemented during the rigid-flex PCB Gerber layout phase of the design process. The first two regulations relate to minimum space requirements, as measured to the flex transition zone(s) within the design of plated through holes (PTH) and external layer copper features. The following two regulations deal with the mechanical flexibility and reliability of the flex areas when the parts are bent into the required shape. 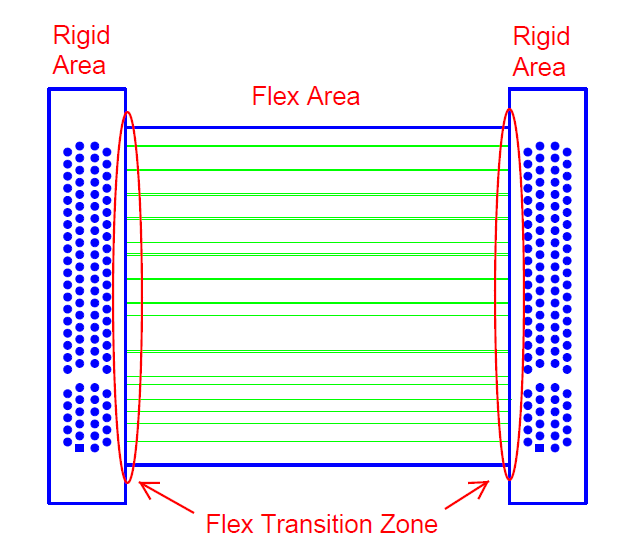 The “Flex Transition Zone” is defined as the length(s) of the rigid section(s) outline at which the layer structure changes from a rigid area to a flex only area. The Flex Transition Zone(s) are created by the requirement to extend the flex area coverlays by a small distance into the rigid areas. This allows the flex coverlays to be captured by the lamination of the rigid area layers and ensure a gapless transition between the flex areas and the rigid areas. 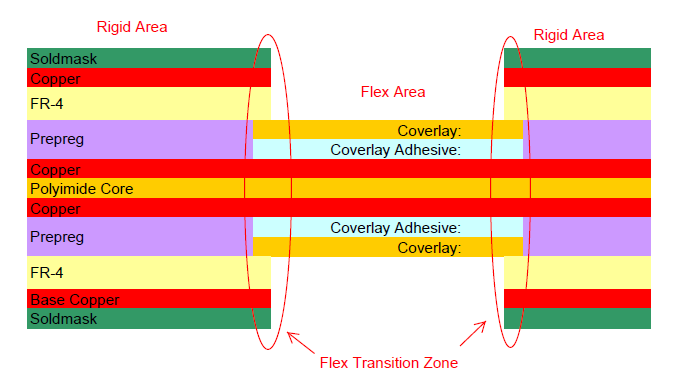 The flex coverlays do not extend throughout the rigid areas as required by IPC 2223C design standard for flexible printed boards. Ensures plated through hole reliability by preventing any PTH from being drilled through the flex coverlays as they engage and are captured by the Rigid area layer lamination. Coverlays are laminated to the flex layers utilizing a flexible adhesive, either acrylic or epoxy based. These adhesives have a very high co-efficient of thermal expansion. A plated through hole drilled through a coverlay will be subjected to considerable Z-Axis expansion and contraction stress during both the assembly re-flow process(s) and potentially during the operation of the finished product. This has been identified as a primary root cause of cracked hole plating resulting in either immediate product failure or long term latent failure reliability issues. This requirement is called out in IPC2223C Sec. 5.2.2.3. Ensures sufficient spacing to allow for reliable external layer imaging processing. Rigid layers, while in production panel configuration and prior to final lamination process, are required to have the flex areas removed. This creates in internal edges, created by the height difference between the rigid area and the flex area, which the external layer image transfer films must transition. 025” min. spacing provides sufficient space for film adhesion and a reliable imaging process. Not recommended and should be avoided if design allows. Adds significant cost due to the additional drilling and plating processes. Requires blind via manufacturing processes. Potentially creates mechanical stress concentrators in flex layers which may lead to breakage if part is bent in the vicinity of these vias. Ensure vias are located away from the specific bend location(s) in flex sections. 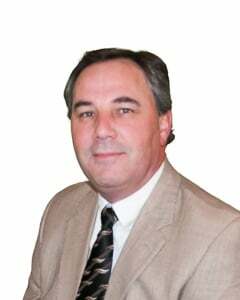 Have supplier review design to evaluate and determine if any risk factors exist. Traces should be kept straight and parallel, if design allows. If trace direction changes are required used curved corners and minimize as much as possible. Helps eliminate potential mechanical stress concentrators which may lead to breakage when flex area is bent into position. Stagger traces on adjacent layers, if design allows. Improves flexibility and reliability by minimizing the “I–Beam” effect of traces positioned directly above one another from layer to layer.